The Great Wall at Badaling. July, 1990. This is obviously not a picture I took this week. It is actually a scan of a slide I took in 1990. 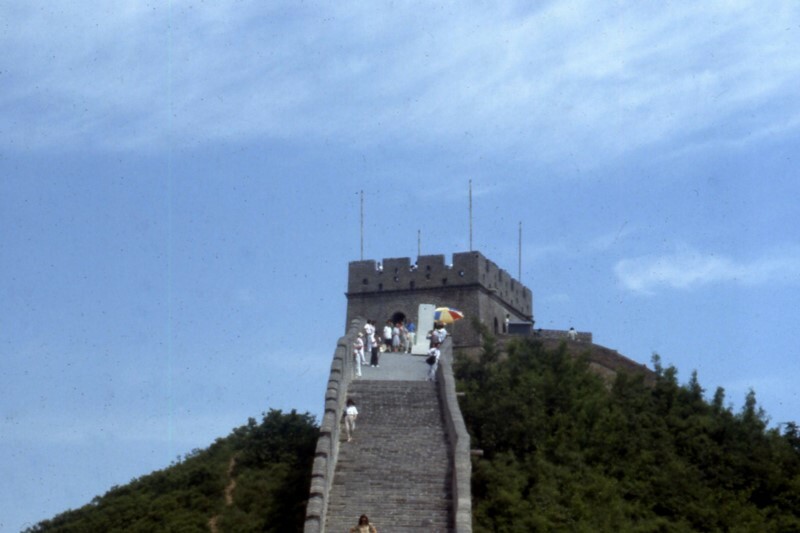 I was on my second trip to China and our hosts took us to the Great Wall at Badaling, outside of Beijing. This watchtower is located at the highest point on the south side of the pass. I made it to the tower, but not before taking this picture. It was a beautiful day for hiking on the Great Wall, and I really like the wispy clouds in that blue sky. The gate at James Fort in Jamestown Settlement. June 20, 2007. We’ve had rain off and on for the past couple of days, so I’ve been able to get more work done on some of my back-logged photos. If we had enough rain for me to completely catch up, I think we would all need arks. 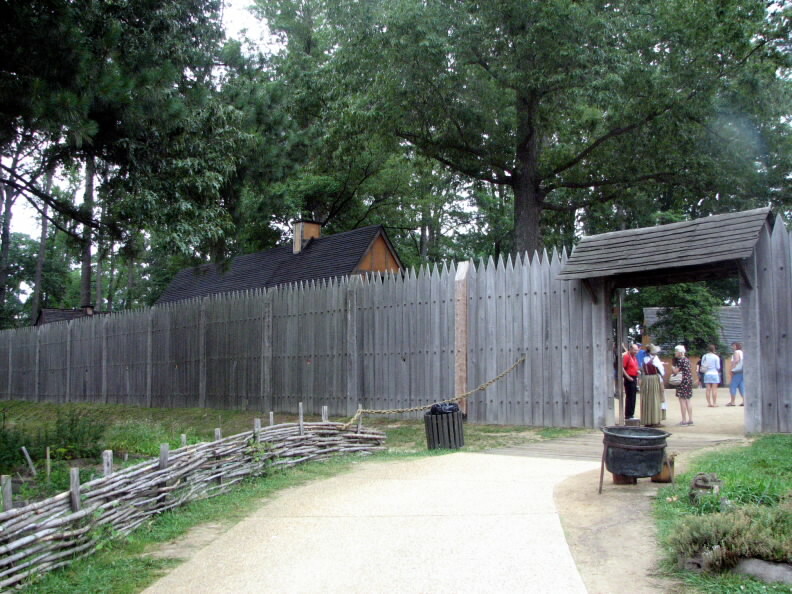 The picture above is the entrance to James Fort at Jamestown Settlement in Virginia. Betsy and I went there in 2007 to celebrate the 400th anniversary of the settling of Jamestown. Jamestown Settlement is a living-history museum on the road leading to the National Park, so we stopped there first. Jamestown Settlement includes a film about the first two decades of the Jamestown colony and several galleries of artifacts from both English settlers and Powhatan Indians. The Settlement also includes a re-created Powhatan Indian Village, replicas of the three ships which brought the English settlers to Virginia, and a full-scale replica of the fort built by the settlers. You can see more of our pictures from Jamestown Settlement HERE. 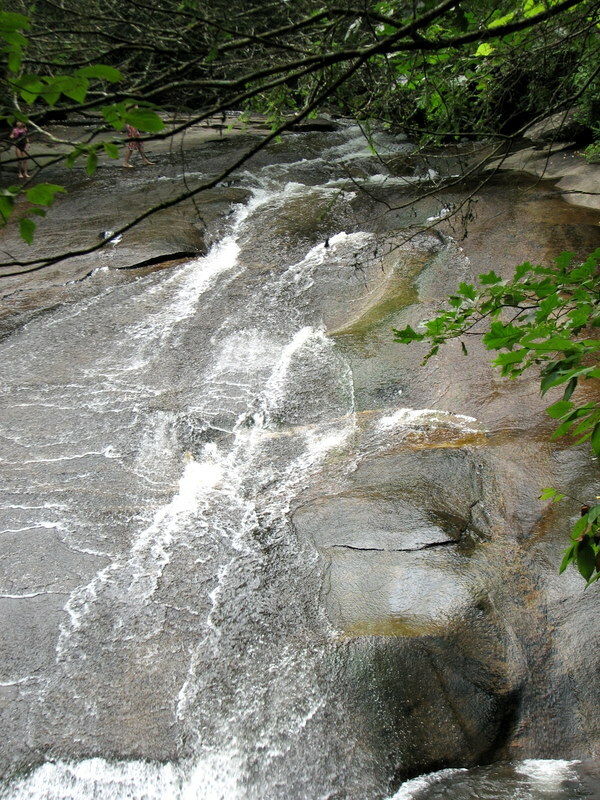 Sliding Rock, Brevard, North Carolina. July 11, 2009. The pretty little fall shown above is Sliding Rock in the Pisgah National Forest near Brevard, North Carolina. Sliding Rock gets its name from the fact that sliders patiently line up and wait their turn to ride the chilly water down the 60-foot flat, sloping boulder. At the bottom of the slide they splash into an eight-foot deep pool and swim a few strokes to the shore, get in line, and do it all over again. 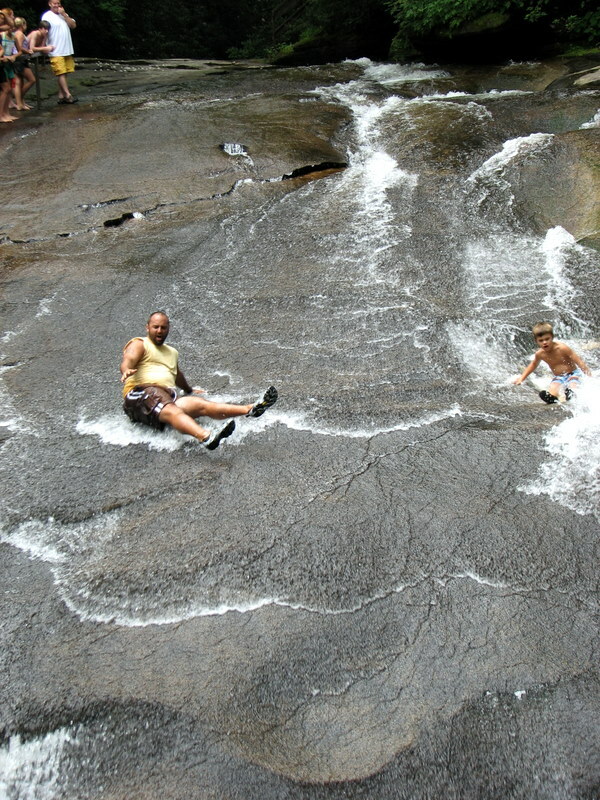 Sliding Rock is a natural waterslide fueled by 11,000 gallons of water flowing down the rock each minute. Since the stream comes down from the mountains, the water temperature is always on the cool if not down-right cold. Bob and Sean at Sliding Rock. July 11, 2009. This second picture shows my son and grandson putting Sliding Rock to its proper use. I usually take part in the My World meme on Tuesday, but I’m skipping this week. When I woke up yesterday (Monday) morning, I had my day all planned out. The front lawn needed mowing, there were weeds in a periwinkle bed that needed to be pulled, and I had more work to do on a retaining wall I’m building along the road. With luck I could get much of that work done before it got uncomfortably hot outside (summer has returned to the Plateau). Then I went into the kitchen and turned on the lights . . . only half of them came on. My day went down hill from there. Don’t get me wrong — I really like our house and think it is just about perfect. But the lighting in the kitchen is one thing that I would change if I could. We have two eight-foot long fluorescent light fixtures in the kitchen, above a drop-down ceiling composed of plastic ‘screens’. To get to the fixtures the first thing that needs to be done is remove some of the screens. I hoped against hope that the problem was just a bad bulb, but switching bulbs between the fixture that worked and the fixture that didn’t work produced no change. The bulbs were fine. The next possibility was a bad ballast. We’ve had to replace the fixtures since we’ve lived here and we got our replacement fixtures at Lowe’s. So we wrote down all the numbers we could find on the old ballast and headed to Lowe’s. Of course the old ballast was no longer available, so we purchased an ‘equivalent’ ballast and headed back home. 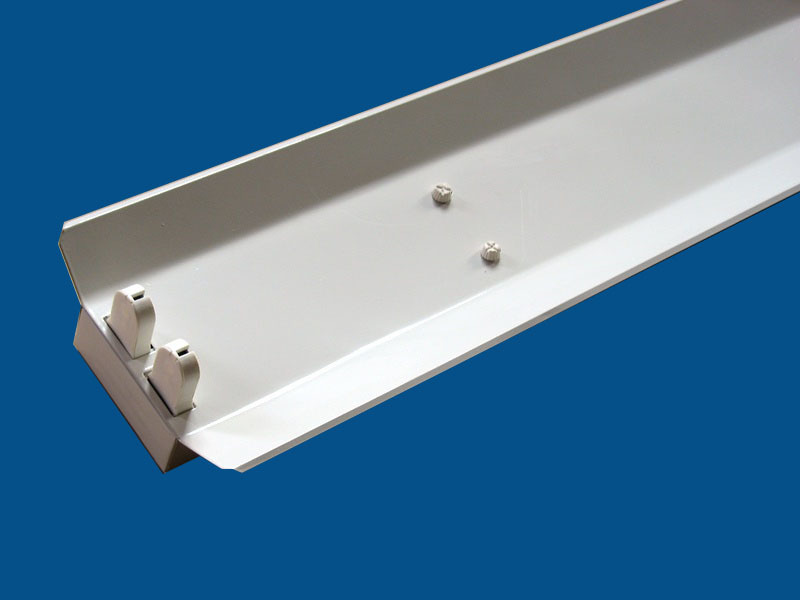 I was able to get the new ballast into the fixture without any problems, but that’s when I noticed that the wires weren’t long enough to reach the two ends of the fixture. Much experimentation showed that there was no way I could attach the ballast to the fixture (necessary to ground the ballast) and get the wires to reach both ends of fixture. So I did some splicing, taped all the splices well, and put everything back together. I put the bulbs back into the fixture and flipped the switch. All the lights came on . . . FINALLY!!! Now all I had to do was put the drop-down ceiling back. Of course once that was done, the day was practically over. Needless to say, I didn’t get much done on that list I had in mind when I woke up. Maybe we should consider renting. 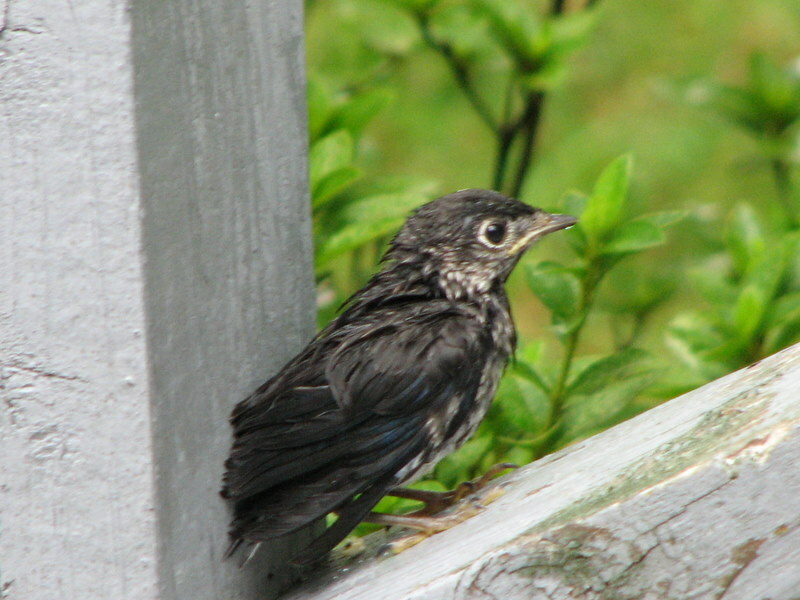 A baby bluebird on our deck. July26, 2009. 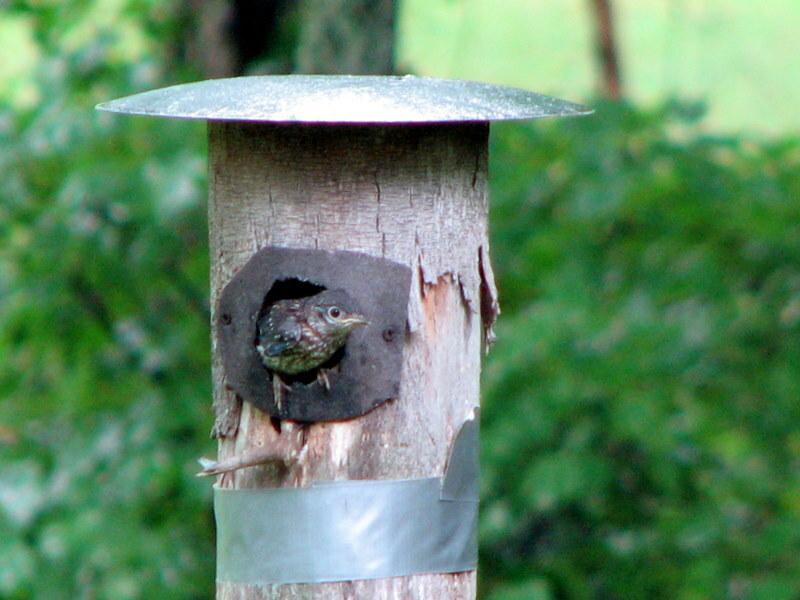 If you have been reading Betsy’s blog, you know how interested she has been in the bluebird family that has been nesting in our back yard. We’ve been watching the second brood and Betsy felt that it was close to the time for the babies to fledge. In the late morning yesterday Betsy noticed the baby bluebird in the above picture on the deck. He most have flown to the deck from the nest, but he wasn’t very good at flying just then. He mostly ran around the deck before falling off the edge. Fortunately he wasn’t hurt. Were there any birds left in the nest? A quick check of the nest showed that there were still babies in there, but that they were thinking about venturing into the big world. Ready to explore the world. July 26, 2009. Betsy was able to see the maiden flight of one of the babies. They didn’t get very far on that first flight, but at least they were out in the world. Daddy and Mommy Bluebird (and the juveniles from the first brood) kept a close watch on the babies, encouraged them in their efforts to fly, and in general offered moral support. 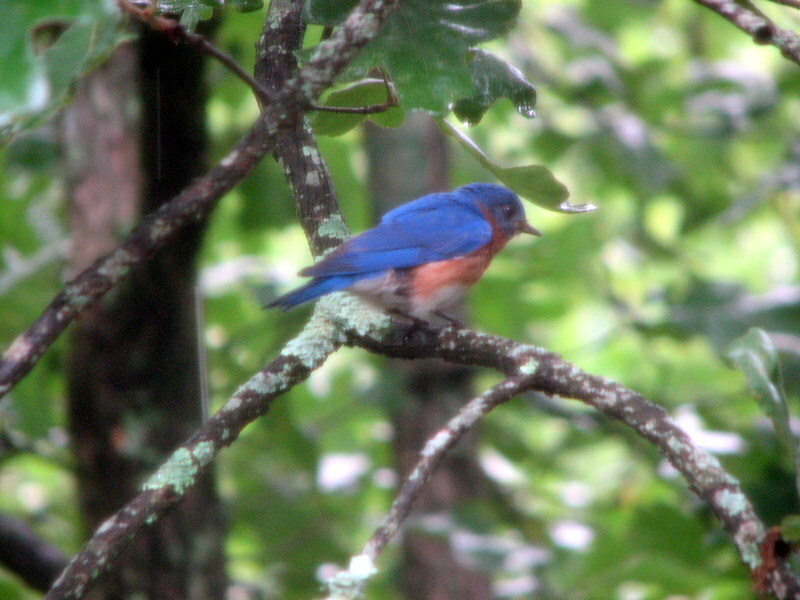 Daddy Bluebird keeping watch. July 26, 2009. But things got very interesting when squirrels got too close to a baby. Then all the bluebirds started chattering and raising a ruckus. If the squirrel didn’t leave quickly enough, the bluebirds started dive-bombing it. I didn’t know squirrels could move so fast once that started. I only wish we could have captured a picture of that. Newfound Gap, Great Smoky Mountains. May 19, 2001. As I mentioned the other day, Betsy and I visited with friends at Cades Cove in the Smokies on Thursday. That visit got me looking at other pictures we’ve taken in the park, and I decided to share these pictures with you. 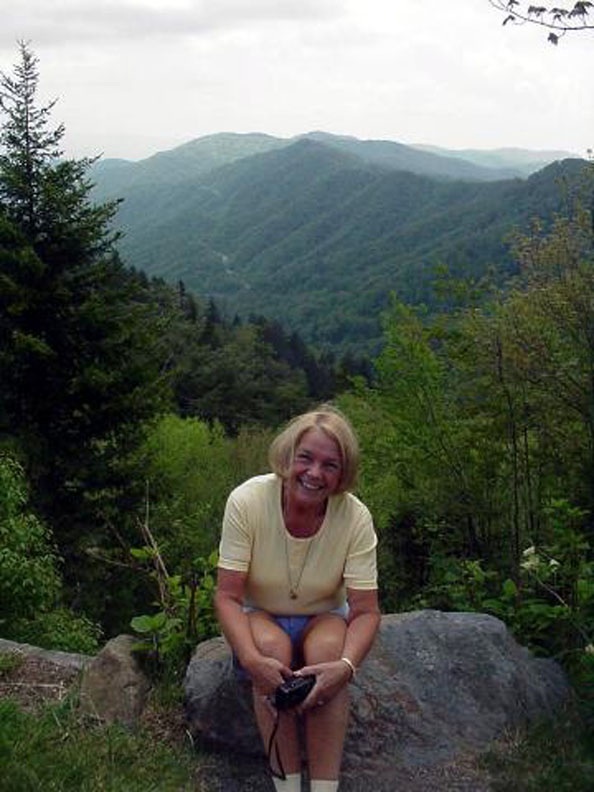 The picture above was taken in 2001 at Newfound Gap. As southerners know, a gap is a low point in a mountain ridge. 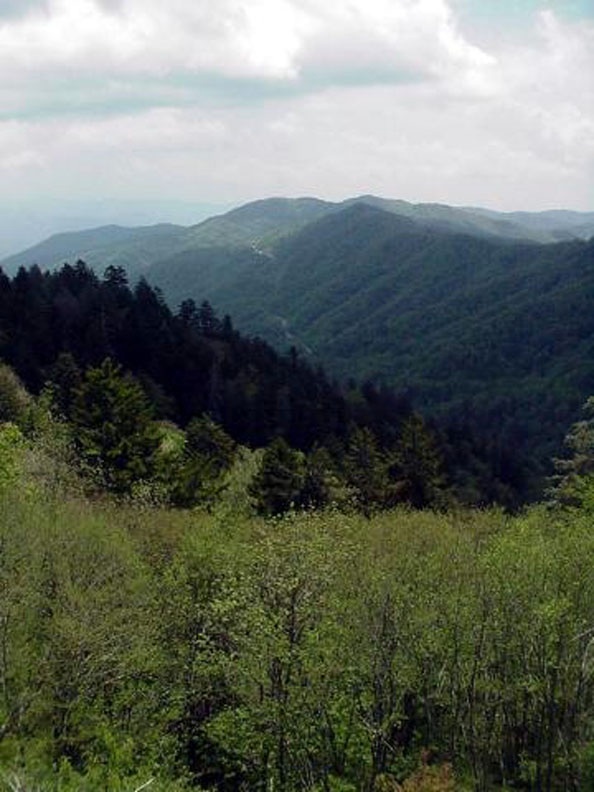 New Englanders call such places “notches” while westerners refer to them as mountain “passes.” At an elevation of 5,046 feet Newfound Gap is the lowest drivable pass through the Great Smoky Mountains National Park. The old road over the Smoky Mountains crossed at Indian Gap, located about 1.5 miles west of the current site. In 1872 a Swiss geographer, Arnold Henry Guyot, discovered Newfound Gap was lower than Indian Gap. When the lower, easier crossing was discovered, it became known as the “newfound” gap. A new road followed, and it became the forerunner of Newfound Gap Road, which can be seen in the distance in the picture above. But as scenic as the picture above may be, the following picture is even more scenic. That’s because it shows my beautiful bride at that same location on the same day. Betsy at Newfound Gap, GSMNP. May 19, 2001. Yorktown Victory Center, Yorktown, Virginia. June 19, 2007. I’ve had a chance to work on photos over the past several days and came across pictures that were taken when Betsy and I visited Virginia in 2007. We went to celebrate our anniversary and to visit Jamestown, Williamsburg and Yorktown. 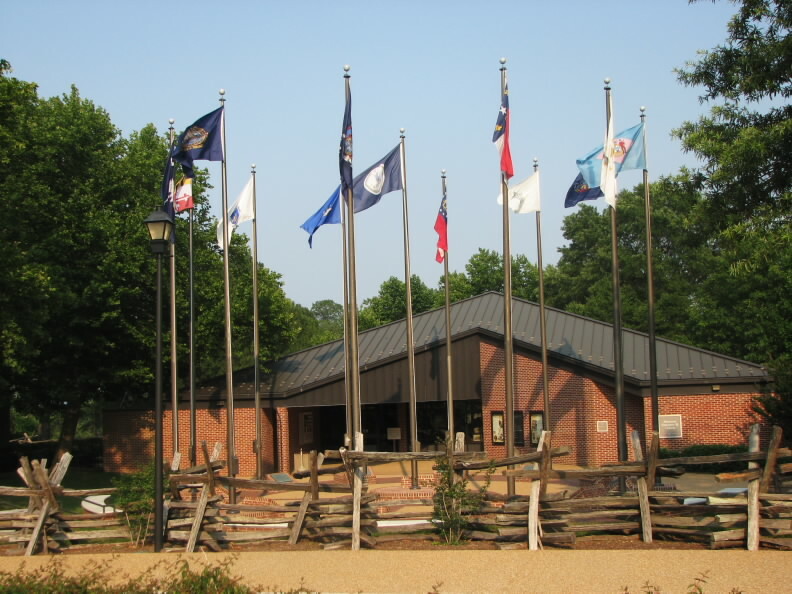 The first place we visited when we got to the Colonial National Historical Park was the Yorktown Victory Center. The Victory Center is a living-history museum that helps bring the American Revolution to life. In addition to a film about the Siege of Yorktown, there are re-enactors in a Continental Army encampment who help bring that period to life. We enjoyed our time at the Victory Center and found it to be very interesting. Afterwards we saw a little of the riverfront in the town of Yorktown. It was a very nice beginning of our historical vacation. If you would like to see more pictures from the Yorktown Victory Center, click HERE. 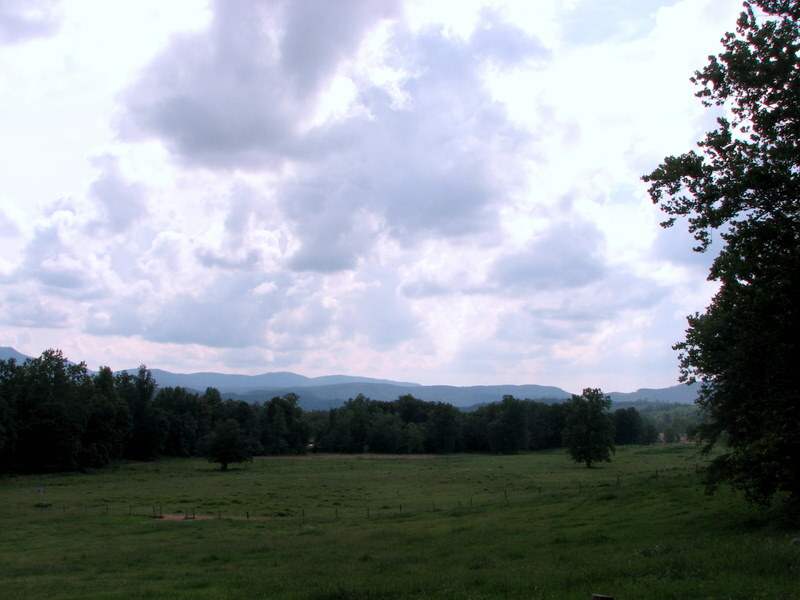 Cades Cove, Great Smoky Mountains, Tennessee. July 23, 2009. Yesterday Betsy and I visited our friends Judy and Charlie, who were camping at Cades Cove in the Smokies. Judy and Charlie camp there every year, and Betsy and I usually go over to visit with them at least one day. We sit around a campfire (it’s been cool in the mountains) and get caught up on what each couple has been doing since the last time we got together. We talked so much yesterday that we didn’t have time for a hike, so the best Betsy and I could do was drive to the beginning of the Cades Cove loop and get a few pictures. That’s where the picture above was taken. Celebrating our monthaversary at Cafe Uno, Maryville, Tennessee. July 23, 2009. Yesterday was our 97th ‘monthaversary’. We decided since we met so late in life we would celebrate our wedding ‘monthaversary’ as well as the anniversary. 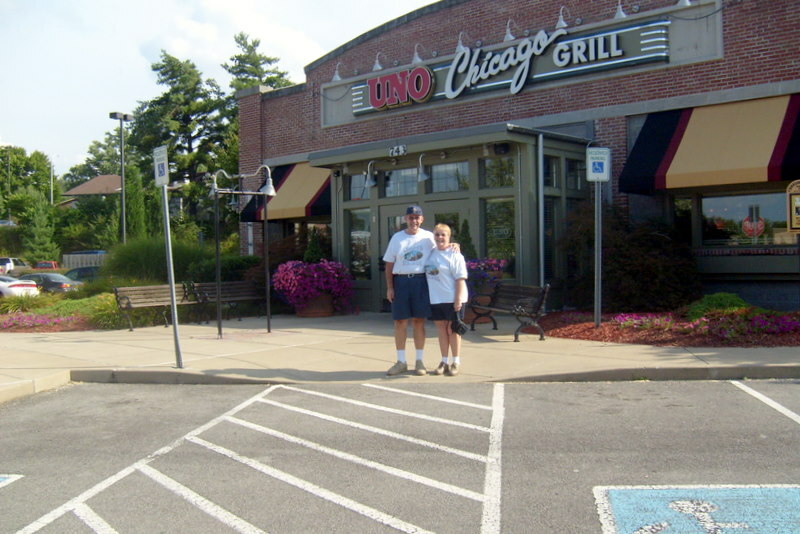 Since it was on the way home, we decided to stop at Uno’s for a deep dish Chicago pizza. It had been quite some time since we had one and that seemed like a great way to end a special day. Sempervivum in bloom, Fairfield Glade, Tennessee. July 2, 2009. I’ve mentioned before that Betsy and I have planted sempervivum (hens and chicks) around the house. Sempervivum are succulent evergreen perennials that produce low, compact, evergreen, flower-like rosettes of succulent leaves. The plants send out numerous offsets, and spread in this manner to form a dense colony. The parent rosettes are the hens, and the smaller rosettes that spring from them are the chicks. The name Sempervivum has its origin in the Latin Semper — which means forever — and vivo — which means live. Sempervivum are called ‘live forever‘ because this perennial plant keeps its leaves in winter even when the temperatures drop below freezing. 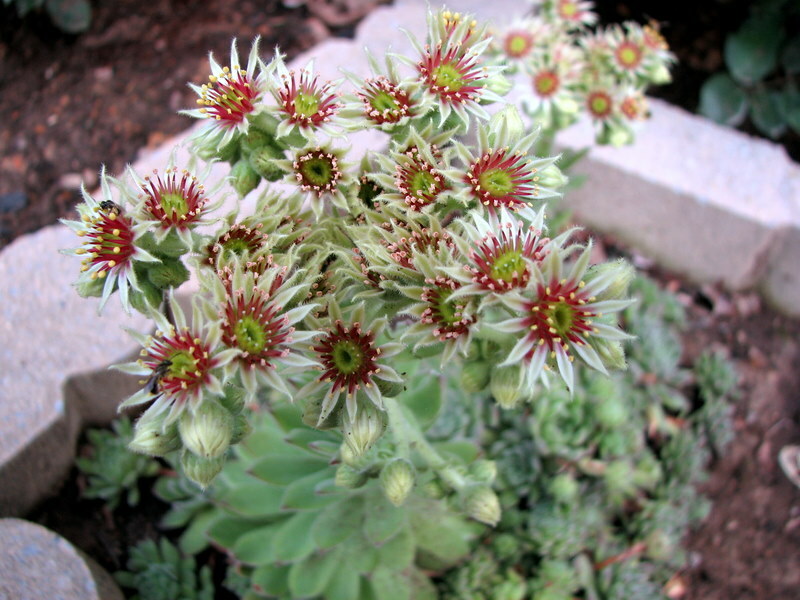 Although grown for its foilage, usually in rock gardens or containers, hens and chicks do flower. Flower stems up to 18 inches develop from the hen and produce blossoms with color varying from rose to pink. The hens will die after flowering, but by that time they will have produced numerous chicks to take their place. The picture above is of hens in bloom in one of our flower beds. The stem will last for a couple of weeks before wilting away. It’s a shame that the hens have to die, but what a way to go!!! Intracoastal Waterway, Little River, South Carolina. June, 2001. The picture above was taken on the Intracoastal Waterway in Little River, South Carolina. I lived in Little River for four years and enjoyed my time in the area. 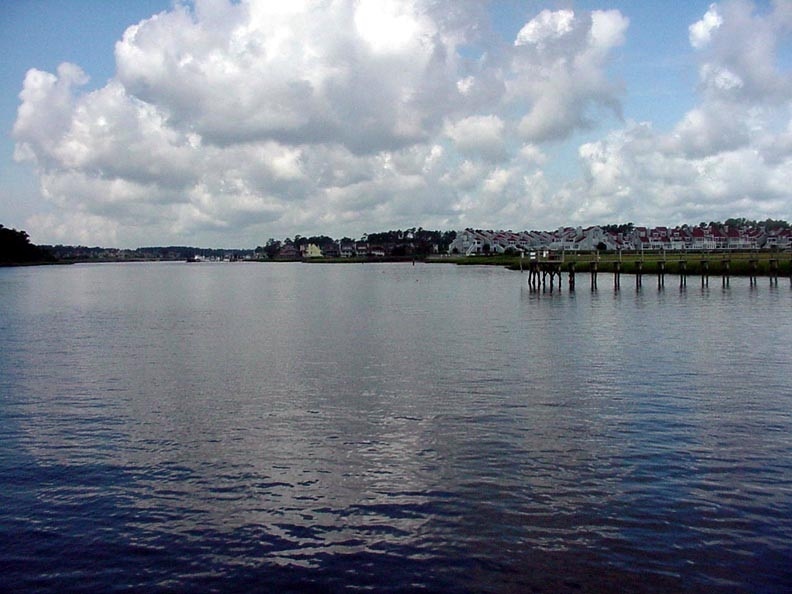 Little River is a fishing village north of Myrtle Beach. As you can see from the background in the picture, the city in encroaching on the village. Those homes weren’t there when I moved to Little River, but were built before I left. The waterway is a little busier now as well. When I lived there most of the boat traffic was fishing vessels or pleasure craft. Now two casino boats are homeported in Little River. They use Little River Inlet to access the ocean for gambling cruises. Betsy and I visit Little River about once each year, but we go for the seafood, not the gambling.